The SLA 7000 -- tighter lead times and closer customer liaison. ARRK Silhouette has installed the latest generation of solid imaging technology - SLA 7000. 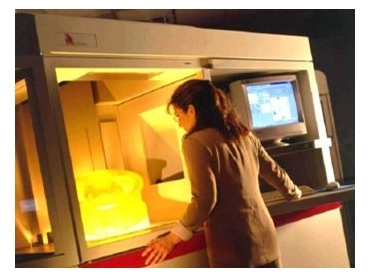 The SLA 7000 represents 15 years of R&D laser building technology, focused on delivering state-of-the-art rapid prototyping. It delivers superior build speed and accuracy compared to older SLA machines. A dual beam laser, drawing at speeds of up to 9.52m/s, has a variable beam diameter with a variable layer build thickness from high definition to standard to fast, combined with the largest single build volume size. TOUGH SLA is suitable for the testing of snap fits, clips or where flexibility is all important. Uses include interior vehicle components, domestic appliances and electronic components. The installation of the SLA 7000 in Arrk Silhouette's Melbourne facility, with full environmental controls for room temperature and humidity, ensures tighter lead times and closer customer liaison. In order to build SLA master models, customers need to supply 3D CAD data in an appropriate format. The data is "sliced" into layers and downloaded into the SLA 7000. The high power UV laser solidifies a liquid epoxy resin one cross-sectional layer at a time to build a physical model that is both accurate and virtually limitless in attainable complexity. In general, SLA master models are used by product development teams to satisfy "one-off" requirements such as form and fit trials or tools to aid in concept communication between supplier and customer. SLA master models also form the basis for other downstream prototype tooling services.